As I mentioned in my last post, I've been trying to make the most of my existing wardrobe. It's actually been lots of fun creating new outfits and getting wear out of everything I have. I really struggled with 'No buy July', but now that the pressure is off, I seem to be doing quite well! As you know, I love quirky and unique accessories! Necklaces, rings, earrings, bracelets, scarves, bags, shoes.....they make me so happy! Therefore, it comes as no surprise to know that I find the best way to create new outfits is to choose a fun accessory and build the outfit from there. 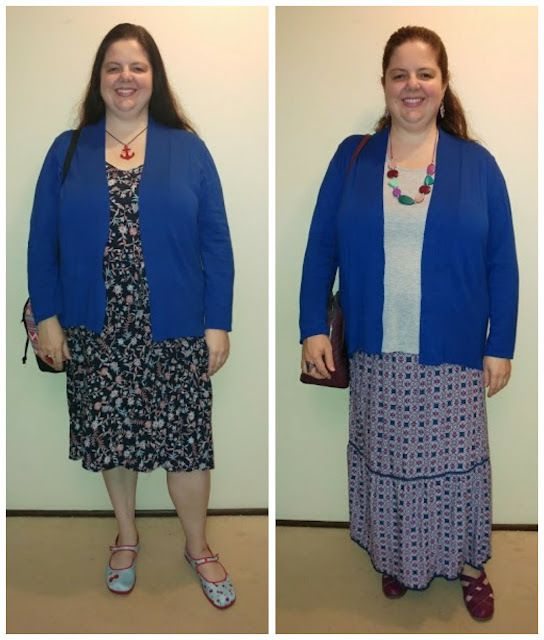 This time, I built two outfits around my scarf! 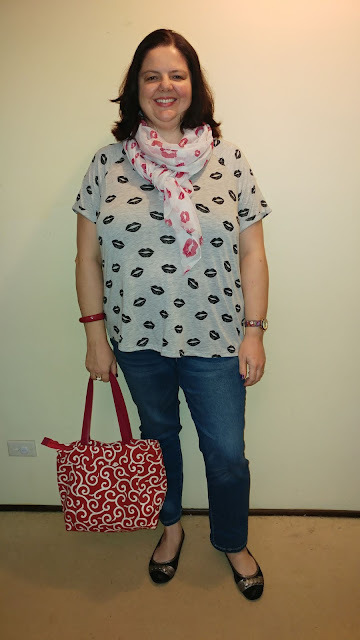 For the first outfit, I went a bit matchy-matchy and kept with the kisses and hearts vibe! For the second outfit, I was feeling a red/white/blue colour scheme. I've been going through my wardrobe again on a mission to see what I actually wear and donate what I don't! One thing I noticed whilst rummaging and sorting through my clothes, is how many cardigans I have! Tees may come and go from my wardrobe rather often, but most of my cardigans have been in my wardrobe for at least a few years. 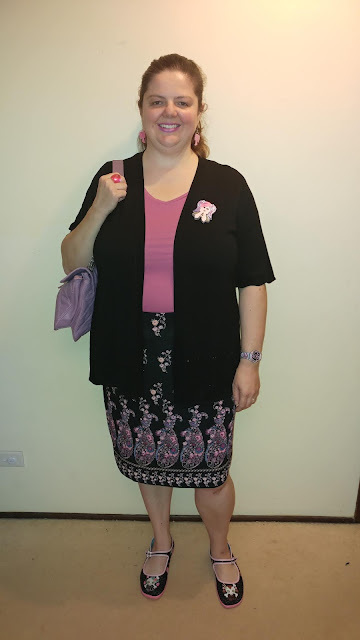 I've built up quite a colourful cardigan collection over the years and I realise that this is a great thing because they are versatile and last years! Blogging has certainly influenced me in a positive way and helped me to shop more mindfully. I certainly have a long way to go and am not claiming to be the most eco-friendly blogger, but I am learning and striving to buy pieces I know will get worn lots and will last. Fireworks top styled 2 ways! 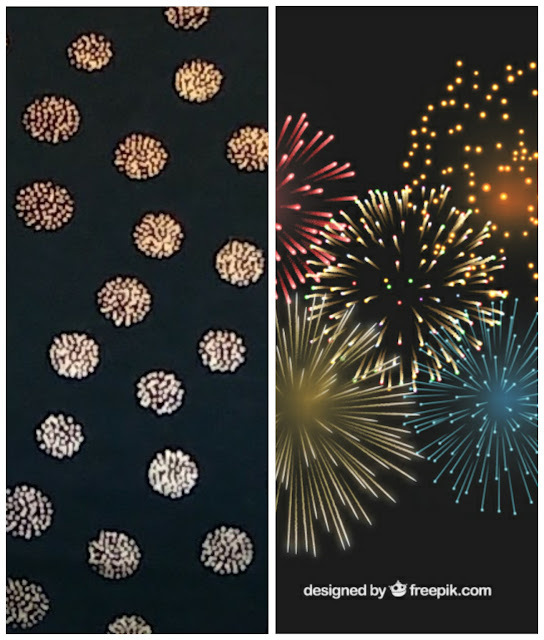 At first glance the pattern on this top looks like solid spots, but they are actually foil print sprinkles, or as I like to call them, little fireworks! This top actually brings back memories of living in Japan, when during the summer festivals, there were fireworks all the time! I remember one such festival that I attended, sitting on the beach watching the fireworks light up the black sky. It was such a special time, with so many new experiences. Anyway, back to the outfit! I only recently wore this top for the first time! I bought it last year at the same time as another similar foil print top, (worn here), but had forgotten all about my fireworks top! To make up for my oversight, I decided to wear it twice in the same week! Here are the two outfits! These shoes have been the inspiration for many pink and black outfits lately! You know how much I love fun and quirky accessories and these shoes are no exception! As well as having such fun designs, these shoes are just so comfy! (Not a sponsored post: just love 'em!😉). Black and pink has never really been a combo I've worn much before, but these shoes have prompted me to look through my wardrobe and create some new outfits based on this colour palette. Such is the power of amazing accessories! The accessories: Necklace: Tattooed Zombie Ring: Diva Bracelet: Lovisa Bag: Bought at markets 20+ years ago! I've always been fascinated by the sea and its creatures. I love visiting aquariums and seeing all the weird and wonderful colours and shapes of our underwater inhabitants! My favourite aquarium is in Osaka, Japan. One could easily spend an entire day (if not more) checking out the amazing sea life! One creature that has always intrigued me in particular, is the jellyfish. When I saw these fabulously quirky blue sparkly jellyfish earrings (below), I knew I had to have them! Infact, they were the inspiration for this outfit! 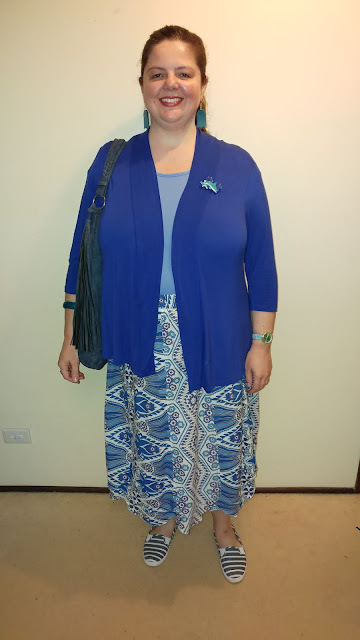 I chose to wear all of my fave blue pieces to complement them. Bag: Rockmans I chose this bag because I thought the tassel looks like jellyfish tentacles! Echo of the Ocean Brooch: Erstwilder I thought this diving dolphin was the perfect final touch for this outfit! Jellyfish in the hotel lobby aquarium, Osaka, Japan.